Moustaches on Strings: Why does all of my favorite stuff break? I don't know what the deal is, but everything I love is breaking. Like my red wayfarers, this last fall, I was sitting there at church, and one of my friends reaches over and takes a look at them. I didn't think anything of it at the time, but when I reached for them to put them on when I was leaving, one of the arms (?) fell off. Needless to say, I was devastated. 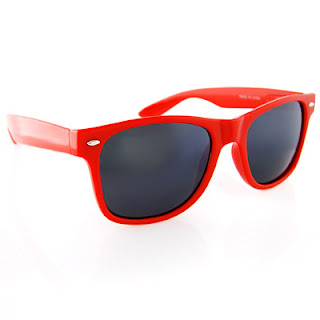 You don't find red wayfarers every day. And today. As I was leaving a meeting, I pull on my jacket and walk back to Hansen, and when I get back my watch fell off of my wrist. Not like I hadn't latched it up right, but it had broken at where the watch face connects to the strap. And this wasn't any old watch. It was the orange one I bought in Ocean City. I LOVE this watch. I hope I can pull it back together. Until then, I won't know the time.